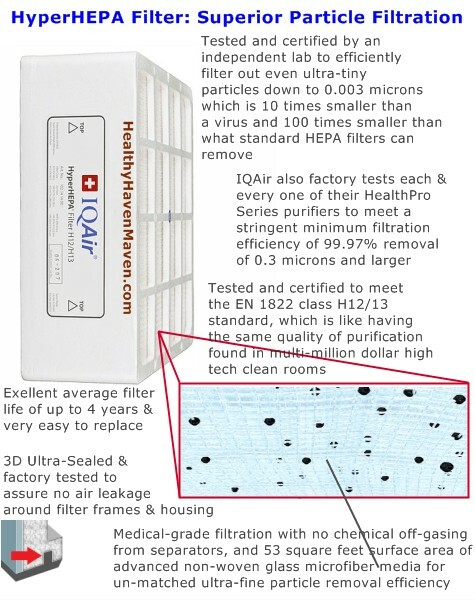 IQAir HealthPro Compact Air Purifiers offer top-rated HEPA air filtration of ultra fine particulates. 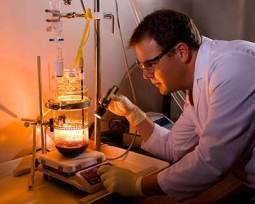 However, they lack any ability to filter out the all-important chemical fumes and gaseous compounds...the major contributors to health damage associated with indoor air pollution. 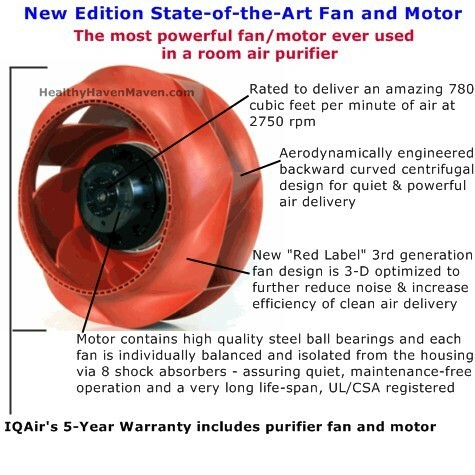 Out of the superior HealthPro series, IQAir's Compact is my lowest rated at 91%, though it is still superior in solid particle capture compared to other non-IQAir models. Click chart below to see our top-rated IQAir purifier HealthPro Plus, which captures major solid AND gaseous indoor air pollutants to nearly and truly 100% efficiency. More compact design, a lower price point, and excellent HEPA filtration of most household particles. 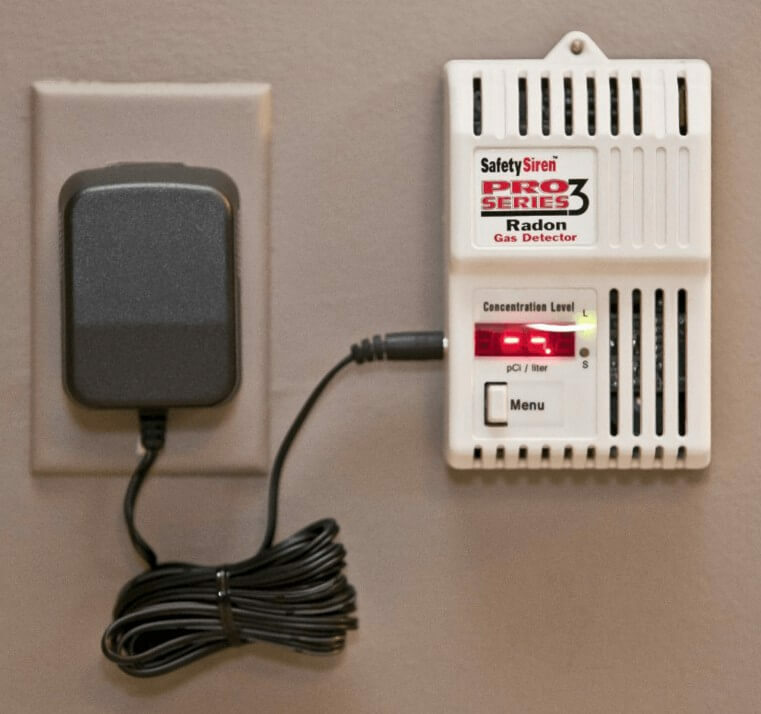 But a major drawback to this model and the reason it is rated lower than the others in the HealthPro series is the fact that this model has no option for gas or odor filtration. 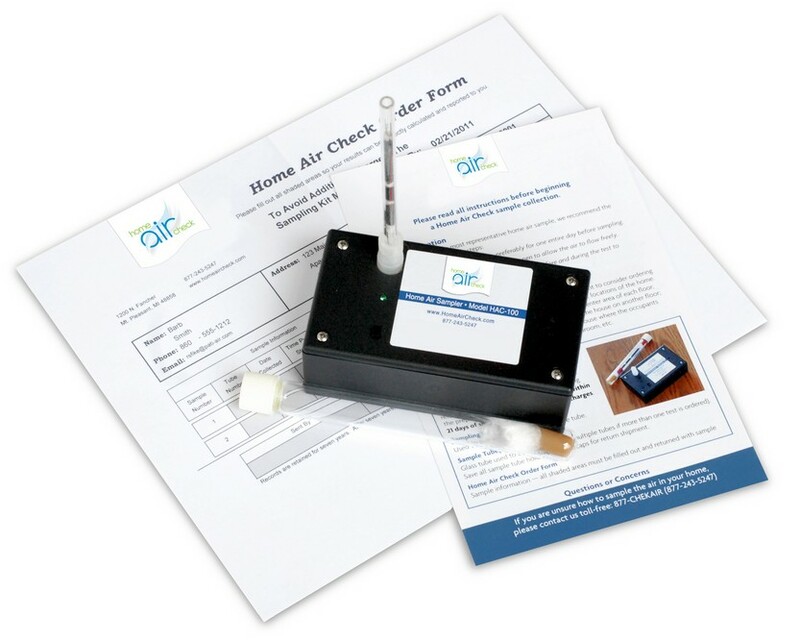 Without chemical gas filtration capability, it means a particularly dangerous category of indoor air pollutants found in most homes (Volatile Organic Compounds) will pass through this unit and remain in your air as an inhalation hazard. Pet Dander from cats, birds, dogs, ect. Please keep in mind no room air cleaner will totally compensate for someone smoking tobacco products indoors. The volumes of gases and particles produced by indoor smoker(s) will overwhelm even the best home air purifier filter technologies. Also, NO home air purifier will remove toxic indoor surface cigarette residue contamination (referred to as "Third-hand Smoke" Residues). Weight w/ filters installed (pounds) 26 lb. 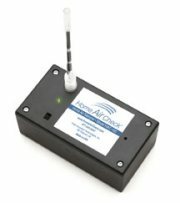 Gas/Odor Filtration Details No Option for Gas/Odor Filtration Available - No V5-Cell Gas / Odor Filter such as in the HealthPro and HealthPro Plus models. Major drawback. Air Intake / Output Air enters through dual arches at base of HealthPro air purifiers and exits at top via a 320 degree "EvenFlowTM" diffuser which reduces air velocity & turbulence, thus reducing noise. Material Safety / Durability Superior IQ Air HealthPro Compact Air Cleaner Housing is Non-offgasing, UV-stabilized ABS, Impact Resistant plastic. Filter Separators are also Non-offgasing. Accessories Included: Power cord and plug included, Hand-signed Certificate of Performance included, Remote Control w/ batteries included, Casters included, Pre-filter, Bonus Pre-filter, and HEPA filter included, and User Guide in VHS and DVD formats included. The powerful centrifugal fan pulls air into the unit through the dual arches at floor level. Triple sealed design assures no air leakage or filter by-passing as air begins to pass through the highly advanced filter stages inside the HealthPro Compact. Air first passes through the advanced Pre-Filter where course and fine particles are removed very efficiently. This preliminary filter stage also helps to extend the life of the subsequent HEPA filter, and is certified to remove 99% of 5 micron sized particles or larger (excellent filtration efficiency for a pre-filter). 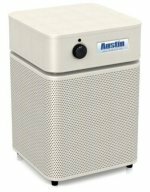 The powerful fan then pushes the pre-filtered air through the highly advanced HyperHEPA filter for clean-room quality removal of nearly 100% of any remaining ultra-fine particles. 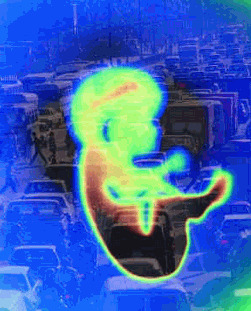 Certified to removed at least 99.97% of 0.3 micron or larger particles (passes world's most stringent HEPA filter test). Air purified of nearly all particles is then releases evenly and quietly back into the room via the specially designed 320 degree EvenFlow diffuser, which cuts down on noise and concentrated air drafts. If you would like to learn more and find the best deal on an IQAir HealthPro Compact Air Purifier, or any of the other better rated models, I highly recommend Allergy Buyers Club. They are my most trusted source for expert ratings, extensive consumer reviews, frequent promotional deals, and excellent expert customer support. 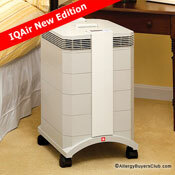 Click the link below to see what Allergy Buyers Club has to say about IQAir's many top-rated models. 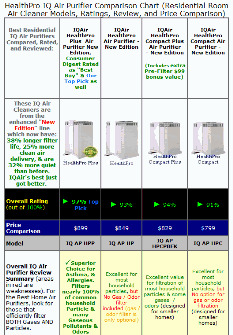 See my comparison chart showing how IQAir HealthPro Compact Air Purifiers stack up to the price, ratings, and reviews of the other 3 top IQ air cleaner models. 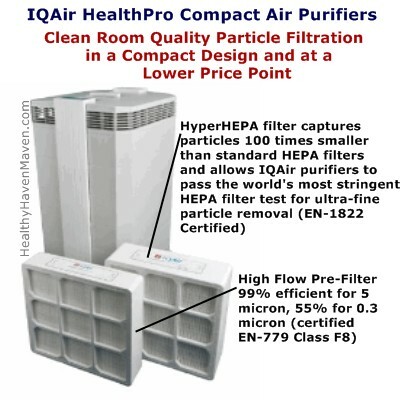 There you will see my top rated model of all, which (unlike the HealthPro Compact model reviewed here) includes high capacity chemical gas, volatile organic compound, and odor filtration - in addition to ultra-fine particle filtration via the HyperHEPA and pre-filter. Or, learn about hundreds of other ways to clean your indoor air - including methods of source control, ventilation, and air cleaning.